London: Secker and Warburg, 1962. The uncorrected proof of the first British edition of the author’s first novel. Octavo, original green wrappers as issued. Signed by the author on the title page. In near fine condition showing only light wear. Translated from the German by Ralph Manheim. 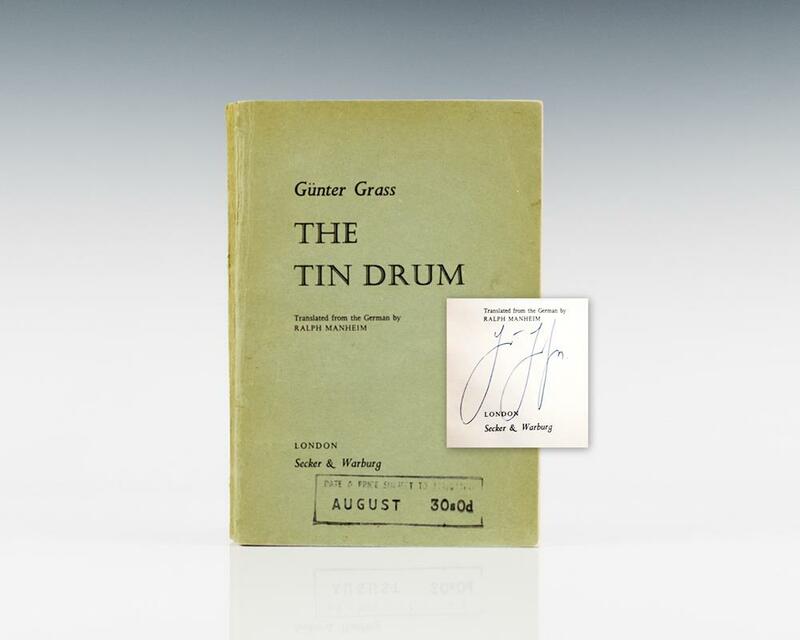 "When Günter Grass published "The Tin Drum" in 1959 it was as if German literature had been granted a new beginning after decades of linguistic and moral destruction. Within the pages of this, his first novel, Grass recreated the lost world from which his creativity sprang, Danzig, his home town, as he remembered it from the years of his infancy before the catastrophe of war. Here he comes to grips with the enormous task of reviewing contemporary history by recalling the disavowed and the forgotten: the victims, losers and lies that people wanted to forget because they had once believed in them. At the same time the novel breaks the bounds of realism by having as its protagonist and narrator an infernal intelligence in the body of a three-year-old, a monster who overpowers the fellow human beings he approaches with the help of a toy drum. The unforgettable Oskar Matzerath is an intellectual whose critical approach is childishness, a one-man carnival, dadaism in action in everyday German provincial life just when this small world becomes involved in the insanity of the great world surrounding it. It is not too audacious to assume that "The Tin Drum" will become one of the enduring literary works of the 20th century" (The Swedish Academy). First American edition of the author’s first novel. Octavo, finely bound in full black morocco. Gilt titles to the spine, gilt ruled to the front and rear panels, top edge gilt. Signed by Gunter Grass on the title page. In fine condition. First British edition of the author’s first novel. Octavo, original cloth. Inscribed and dated in 1986 by Gunter Grass on the half title page. Near fine in a near fine dust jacket. With a signed letter from Gunter Grass’ secretary. Housed in a custom half morocco clamshell box. London: Secker and Warburg, 1965. First British Edition of the Nobel Prize- winning author’s third and final novel in his acclaimed Danzig Trilogy. Signed by Grass on the title page. Near fine in a very good price clipped dust jacket. Die Blechtrommel, Katz und Maus, Hundejahre [The Tin Drum, Cat and Mouse, Dog Years]. Darmstadt: Hermann Luchterhand Verlag, 1959-1963. First German editions and true firsts of the author’s classic Danzig Trilogy. Octavo, 3 volumes, original cloth. Each work is signed by Gunter Grass on the title page. Each are fine in near fine dust jackets. A very sharp set, uncommon signed. First American edition of the author’s first novel. Octavo, original red cloth. Signed by Gunter Grass on the half-title page. Fine in an excellent dust jacket that shows light wear. A very nice example. Die Blechtrommel (The Tin Drum). 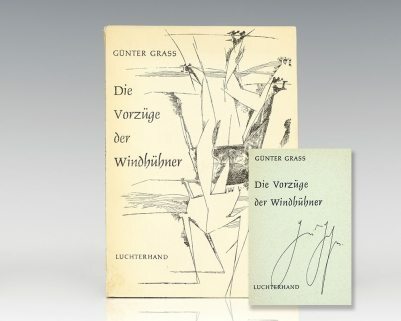 Original print of the cover art of the Gunter Grass’ most famous work Die Blechtrommel. Signed by Gunter Grass on the bottom right hand side. Framed and matted. Measures 24″ x 30″. In fine condition. First British edition of the author’s first novel. Octavo, original cloth. Signed by Gunter Grass on the title page. Near fine in a near fine dust jacket with light wear. A very nice example of this highspot of post-World War II literature. First edition of the Nobel Prize-winning author’s first book. Octavo, original wrappers as issued. Fine in illustrated wrappers as issued. Signed by Gunter Grass on the title page. First edition of the Nobel Prize-winning author’s first book. Octavo, original wrappers as issued. Signed by Gunter Grass on the title page. In near fine condition. First American edition. Octavo, original red cloth. Fine in a near fine dust jacket with light shelfwear to the spine. Inscribed by the author to poet Robert Lowell in a German inscription, translated into English, which reads: “To Robert Lowell, in admiration and in the hope to have the pleasure of meeting you soon in Berlin. Gunter Grass Berlin, Nov 3, 1966.” Association copies of this caliber are rare, especially on what is considered his masterpiece. From the estate of Elizabeth Hardwick, novelist and wife of Robert Lowell. Housed in a custom half morocco clamshell box. Die Plebejer Proben Den Aufstand: Ein Deutshes Trauerspeil. First Edition. Octavo. Near fine in illustrated wrappers as issued. Signed by the author. Uncommon signed. First American edition. Octavo, original gray boards. Signed by Gunter Grass on the title page. Fine in a near fine dust jacket. Darmstadt: Hermann Luchterhand Verlag, 1959. First edition of the author’s first novel. Octavo, original cloth. Boldly signed by Gunter Grass on the title page. Fine in a fine dust jacket. An exceptional example.